Life is good for Nadia and Jack. Their wilderness lodge business is booming, and they’re building a new home together, complete with a couple of dogs. It’s as close to normal as life gets…especially for a pair of contract killers. But for Jack, semi-retirement is a dangerous proposition. There are plenty of people who don’t want to lose his services. He’s halfway around the world when one of those disgruntled clients comes for Nadia. And he has no way to warn her. 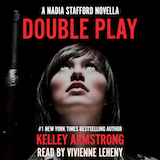 Double Play is available as an ebook and an audiobook. 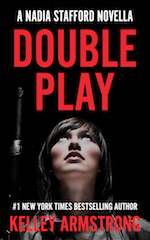 It is also available as a novella duo (with Perfect Victim) in paperback and ebook. Links for all editions below. Note: the button below allows you to purchase directly from me. Use the code WEBSITE for 10% off. For more details on using direct purchase, click here. To purchase from other retailers, use the drop-down list beneath the button. Combined Double Play and Perfect Victim.